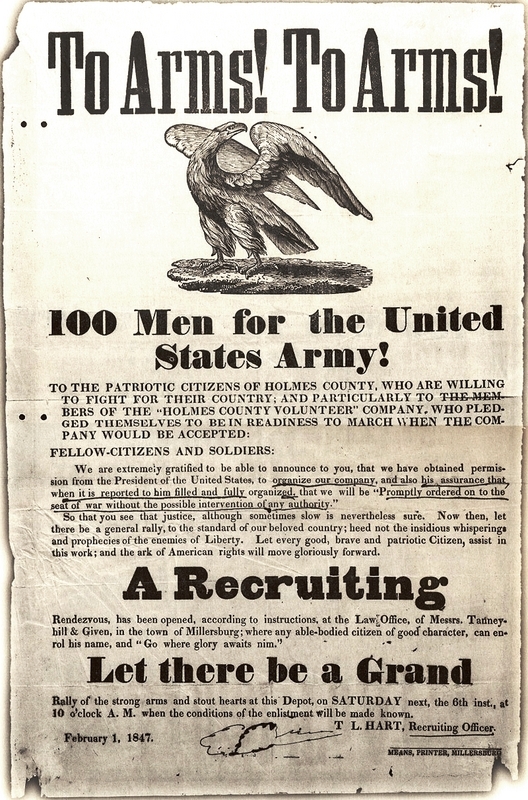 This 1847 recruiting poster urges the men of Holmes County, Ohio to enlist for duty in the war against Mexico. The war was fought by the standing, or regular, U.S. army, alongside volunteers. The U.S. War Department first issued a call for states to raise regiments of volunteer soldiers in May 1846, and the efforts were often marked by local political maneuvering, misleading appeals to potential volunteers, and, with the supply of volunteers not meeting military needs, the coercion of those charged with crimes to choose military service over jail. Source | "To Arms! To Arms!," poster, 1847, Special Collections Division, the University of Texas Libraries, Austin, Texas, available from The U.S.-Mexican War, http://www.pbs.org/kera/usmexicanwar/resources/primary_sources.html#. Cite This document | T.L. Hart, “"To Arms! To Arms! ",” HERB: Resources for Teachers, accessed April 20, 2019, https://herb.ashp.cuny.edu/items/show/1211.